We eat a lot of organic brown rice in our family, which sometimes gets boring. That’s when we remember quinoa! 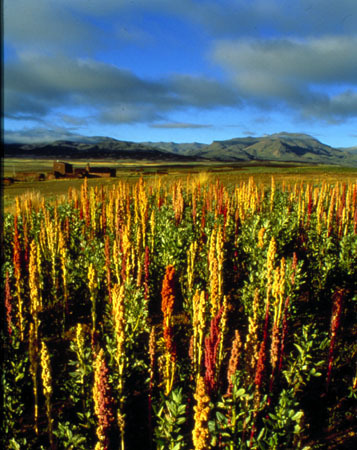 Quinoa is a “sacred, super crop“: sacred to the Incas, super crop to the United Nations for its high protein content. My family likes its nutty flavor, as well as its quick cooking time. It accompanies almost any meal, and it provides a complete protein containing all nine essential amino acids, which is important to a vegetarian family. Quinoa contains the amino acid lysine and is a good source of manganese, magnesium, iron, copper and phosphorous. Quinoa is actually not a grain, but is related to beets, chard, and spinach. Quinoa is the seed from chenopodium quinoa, and I love it for breakfast, lunch, or dinner. It is good in porridge, served in soup, or by itself as a side dish. We buy it in bulk and eat it weekly. Bring water to a boil and add quinoa. Reduce to a simmer and cover for 10 minutes. Turn off heat and let sit for 10 minutes before serving. Thanks for the tip. We only recently got off Jasmine rice and onto brown and that has been a big change! I’ll have to look for this stuff. Um… how do you pronounce it? We love quinoa! My wife makes a tabouli with it. It’s very versatile. After being a fan of Quinoa for YEARS, I discovered Red Quinoa. I find that it holds up better in salads than the regular variety. If you’re using it for a hot and creamy breakfast cereal, I’d say stick with the white, but for everything else I think the Red Quinoa is far superior. If you can’t find it in your local health food shop, you can find it online at http://www.shoporganic.com/product/red_quinoa_organic/grains. Quinoa is our winter breakfast staple, but I haven’t tried red quinoa yet. Thanks, rachel, I’ll check it out! It sounds like it would be a good replacement for cous cous.